How are workouts created inside Calisthenics Academy? Once you click on it this is what you will see. The system gives you the ability to adjust time of your workouts. You can pick the days and choose a time you would like to workout for, from 30 to 90 minutes. How are the workouts created? In the past we had full and split body routines. 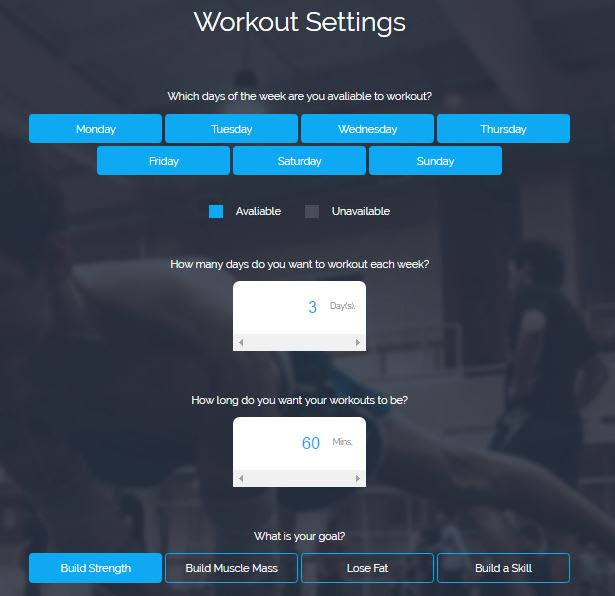 Recently we deployed machine learning algorithms to create the most optimal workouts for you. We are gathering data on how long it takes to physically perform each exercises and averaging it out . We categorise all exercises from each progression under – core, arm, legs (we will add back when we implement back progression). When building your workout our algorithm makes sure that none of the exercises in the same category are next to each others – that enables us to create the most optimal routine for you and give you time to recover. Additionally to categorising each exercises to make sure that its not together for optimal recovery we are also tracking what was the last exercise they did. Our system then rotates them so if they did a pistol it will run them through all the other exercises in a queue before it will hit pistol again. Again optimising for effectiveness and recovery and so you don’t need to worry which exercise you should be doing when and why.